They came from across the galaxy or from just one planet up the street, from the atomic bomb testing grounds, grown large and irritable, or from the bottom of a swamp. They always wanted something -- our relatively clean and fresh planet, or our brains, or our oddly pointy-breasted women -- or simply feared that we would soon achieve space travel and then forget about it, there goes the neighborhood. They were green, or blue, or were black-and-white -- the colour of normal stock footage animals. They wore metallic costumes, or nothing at all. Our weapons were useless against them, and sometimes they teased us about our primitive technology, which was mean of them. Other times they simply chittered as they massed to break down the last barrier door to swarm over us, pincers flexing. Whoever they were, whatever they were ... They Came from Planet 15. Whether knocking over rowboats, ramming larger vessels to get at the tasty treats inside, or crawling out of the loch on a misty night, the sea monster is a primal terror like no other. 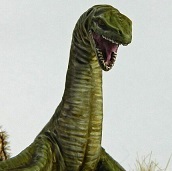 The model is resin, in two parts (its jaw is separate). 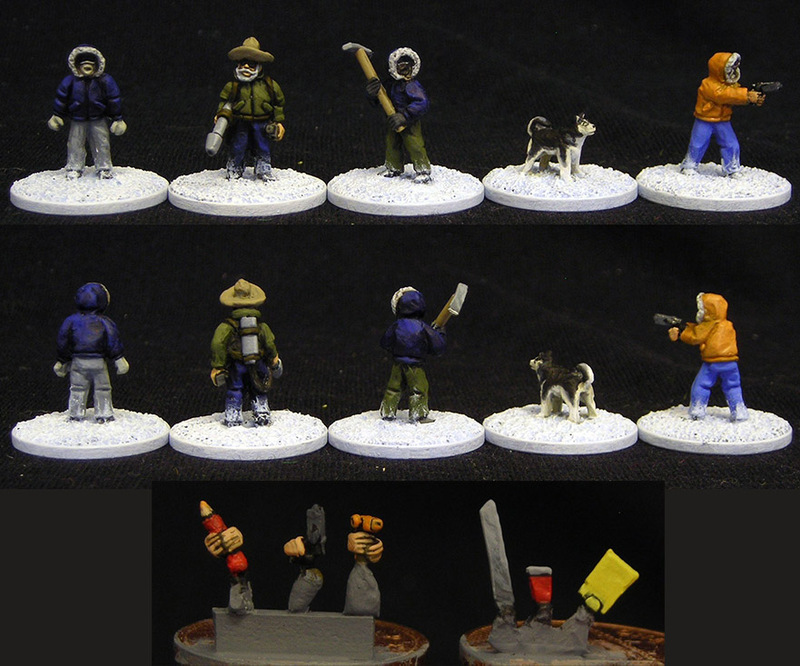 The base and human figurines shown in the image are for reference only and are not included. 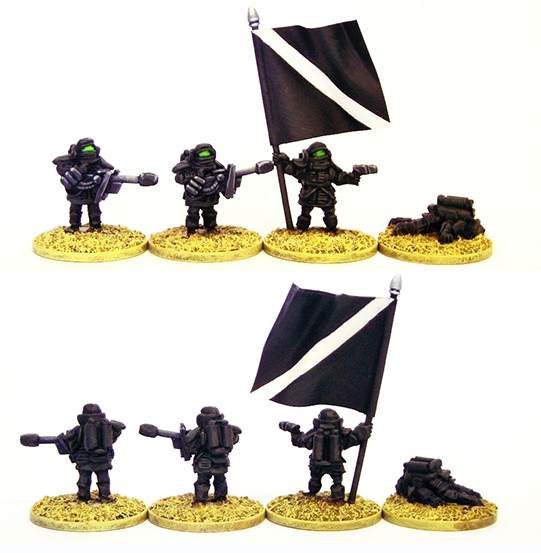 Once the superhuman janissaries of the galactic emperor, but now in decline after centuries of legend, the Formido Militum (terror troops) are no longer worth 100 of any enemy, but they are still worth ten, and that's usually good enough. Usually. The chaps are back and better than ever! All models are now one piece. No more putting the heads on! 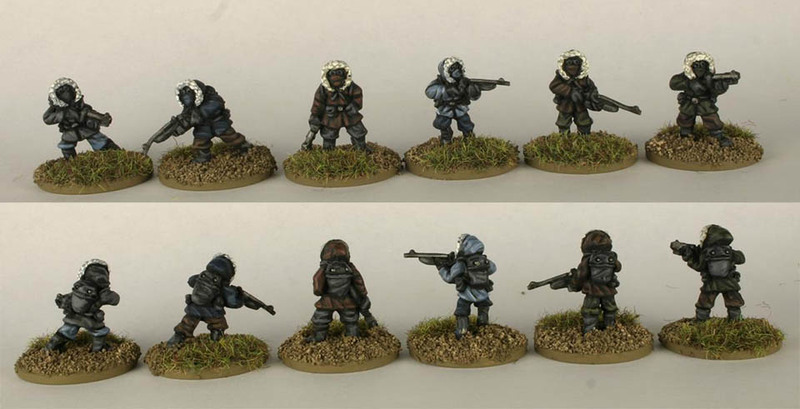 Also more poses, ten for the basic infantry and seven for the command and weapons (four big guns, three commanders), and the models have been improved a bit, with some bits added to their body armour. Two important notes on the chaps -- we cannot accept orders for them which include any models other than the chaps! So if you order anything else I will hav no choice but to cancel your order. Also I can only ship to the USA -- with apologies to customers outside the states. Here they are in their typical confrontation posture -- Serval attempting to reason with the paranormal being/phenomenon, Ginger backing him up, ready to send it back to whatever dimension in came from. Sculpted by Tom Meier, painted by Jen Haley. These are perfect for many real world encounters as well -- Serval is in the perfect pose to "keep him talking" whilst the SWAT marksman gets into position�. 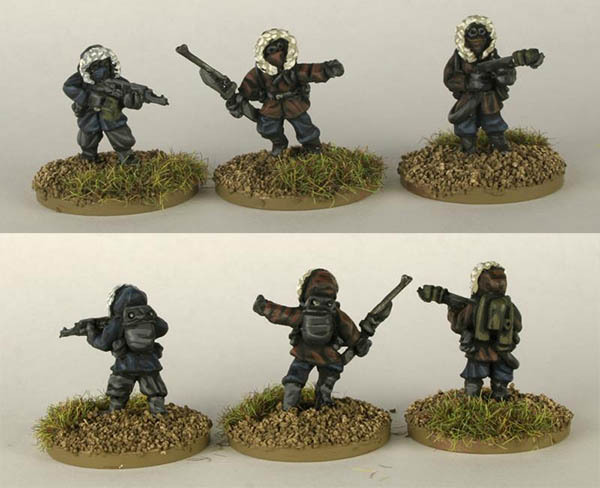 A range of models for gaming sci fi or fantasy conflict in the extreme conditions and near-total isolation of the Antarctic. "Is there life without slime? ", the Slimee thought to itself, as it slithered about the deck of Slimetrail 14, the Slimee warship bound for earth. As if to consider this interesting question further, it brought up an image of a human on its view screen, studying the dry, hairy form carefully. 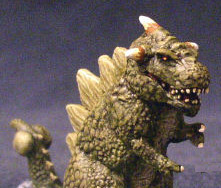 Its brow, already angry, curled up further, its four eyes glaring, its huge sharklike teeth now grinding together. "Noooo, there is no life without slime," it said through clenched teeth, answering its own question. Tentacled invaders from the Andromeda galaxy, the Slimees are here to kill people and mutilate cattle, for reasons best known to themelves. For this purpose each Slimee carries a weapon called a Cattle Mutilator, which can make elaborate surgical removals from bovine bodies seem simple, or, when set on a different power, slowly immolate a human being as it dies with a satisfying scream. 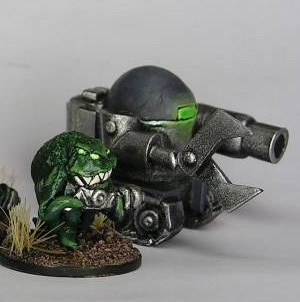 Against serious opposition the Slimees simply slither into personal suits of power armour and head into action, armed with a huge manipulator claw (and by "manipulate" the Slimees actually mean "crush") and the dreaded thundersplat cannon. Clanking along on treads, the suit has a small rocket mounted on the back to surmount such annoying impediments as water obstacles and stairs. 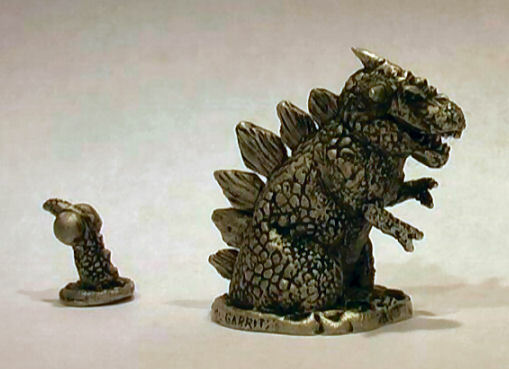 Sculpted by "Whiff Waff," painted by Chris Yaro. Sometimes one needs to rid oneself of evil spirits and so the Spirit Punters, with their strange but effective weaponry, do the trick. 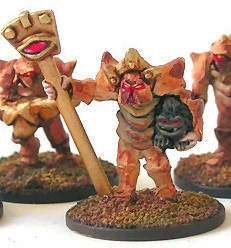 They have encountered, in their battles with demons and aliens, some who are friendly, such as a strange and rather inoffensive hungry demon, a large and very powerful demon who tends to mope but often helps them kill especially pesky foes, and finally a cute little alien who comes from an extremely advanced civilisation. Sculpted by "Whiff Waff," painted by Dags. 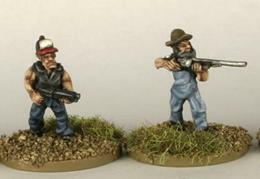 Rednecks painted by Artmaster Studio. For once, the Imperial Master of the Green Martians was worried. 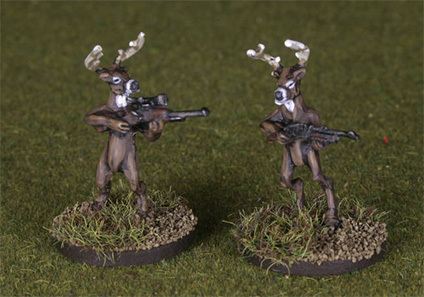 These rural humans were interspersed throughout Earth's upper western continent, and such was their love for hunting the antlered animal that each one had a firearm, sometimes several. Yes, like all humans they had puny brains, and their weapons were like pop guns against the power of the dehumanizer ray, but there were so many of them, and their aggression rating was off all Martian scales, especially when they had consumed distilled or fermented beverages. 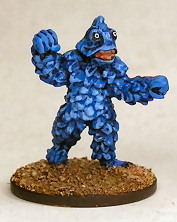 Sculpted by "Whiff Waff," painted by Artmaster Studio. 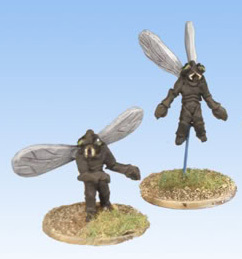 These revolting creatures, half man half fly, buzz about the landscape, causing mayhem. When one of THEM lands of the TV screen, you take notice. Vacation Alien painted by Carl Robson. When overlording it in the sector gets to be too dreary, and a change of pace is needed, it's necessary to clear one's head by removing those of other creatures. Push the console away, get up from the desk, and it's Miller time -- so many species in the galaxy give good sport. Yes, treasure the little things in life. 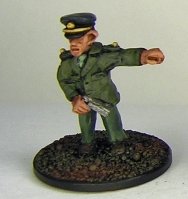 Colonel Nelson painted by Chris Yaro. 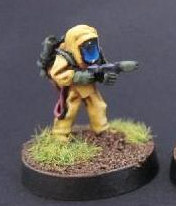 A HAZMAT suited soldier painted by "Spacejacker". It's about to get loose, and we can't let that happen. 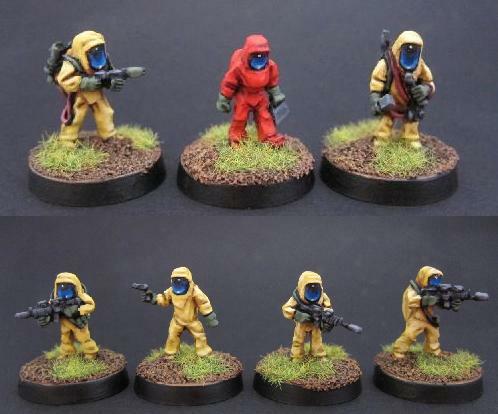 Do these soldiers and scientists in Type A Hazmat Suits come in peace, or do they mean to destroy us? 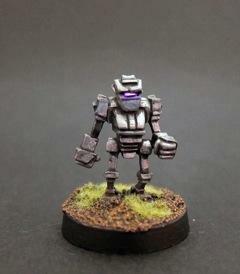 A Furrobot painted by Chris Yaro. To Earth they came, the furrobots, in a cloud of bubbles, and when they set up shop in caves around the world, it was just a matter of time before they used the dreaded oxidizer ray to wipe out all of Mankind. Only a few survivors remain -- can they defeat Spar Tan and his two minions? Will Spar Tan's secret love for the comely survivor, Alice, be the undoing of the invasion? 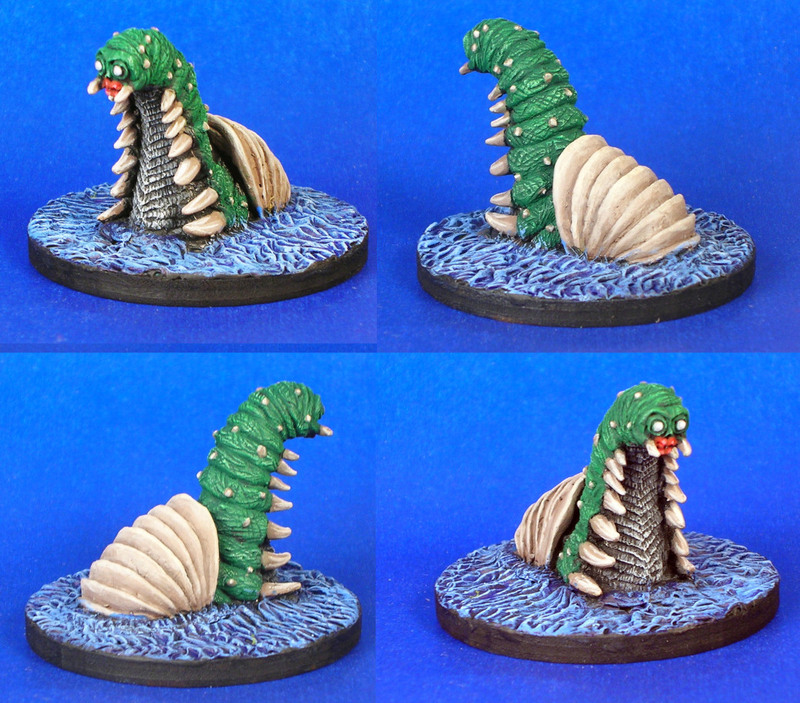 A Fungoid painted by Artmaster Studio. 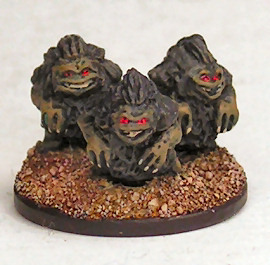 Up from the earth they came, they did, tired of the humans picking them, gobbling them up. It was time for the humans to be picked. So extremely toxic were the Fungoids that one touch was all that was necessary to kill an adult in seconds. And their brute strength was something to be reckoned with. 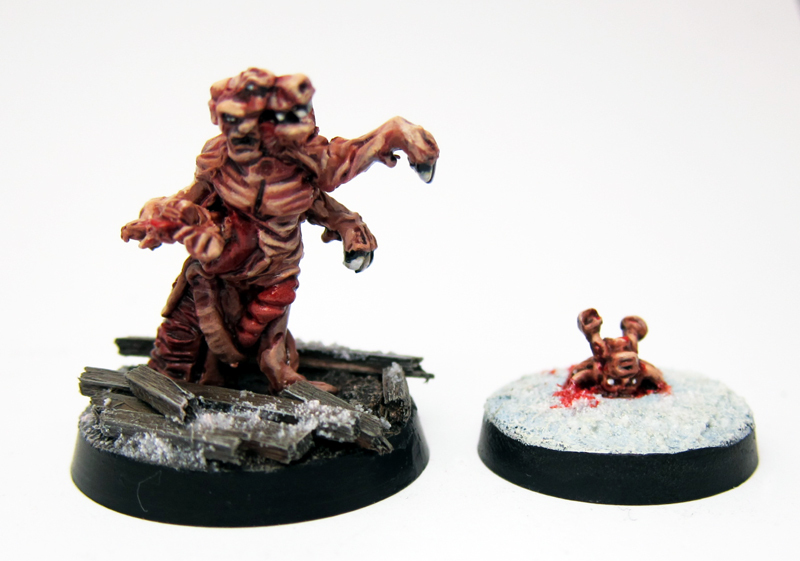 But the terror did not stop there, no sir, for a squad of Fungoid infantry could stop, strain a little, and emit a fast-drifting powder from their caps which, if inhaled, horribly transformed the victim ... into a Fungoid! 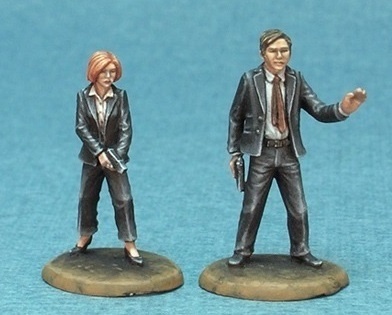 Models are between 12mm and 25mm tall (or so). Sculpted by Iain Colwell. 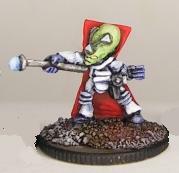 Little Green Martian warrior painted by Chris Yaro. Before you perish under the muzzles of our Dehumanizer Rays, you must bow before us, puny Earthling. Do not resist the inevitable. With your Washington Monument, Big Ben, Kremlin and Taj Mahal all in flames, with your Great Wall of China raised into orbit, then dropped again, surely even your tiny brains must now recognize that Mars is a planet far superior to yours. For have we not brought the Plutonians under our dominion? Do we not manipulate their DNA sequence to create our Plutoluna Mutants, who serve as our mindless slaves and shock troops? And Plutonian technology was superior to the pathetic strivings on the Hu-Man. If you submit now the end will be painless. Well no, it will not, just joking. 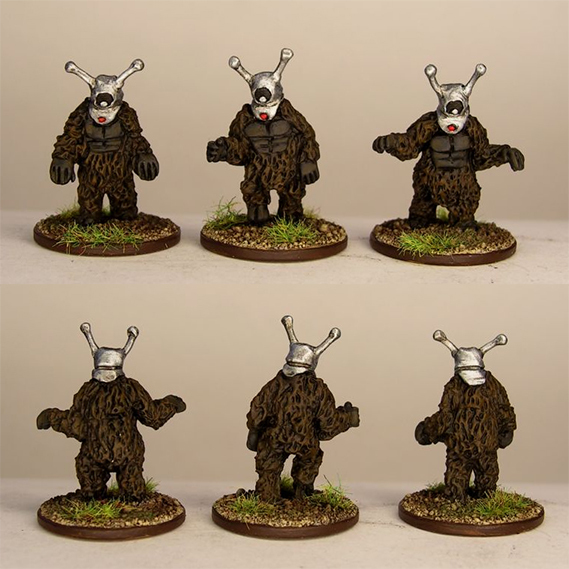 Little green men travelling to distant planets in flying saucers to exterminate the locals. 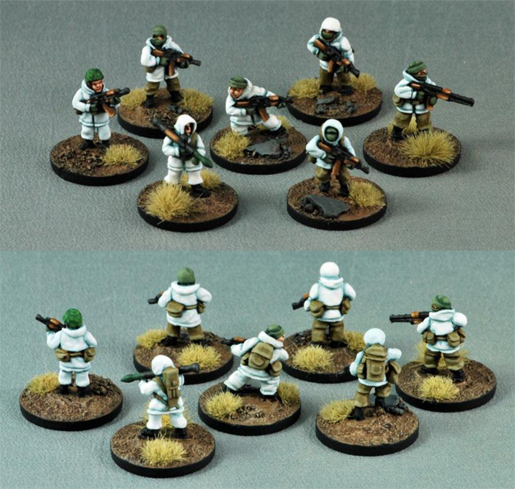 These are not "greys," naked aliens skulking about furtively conducting experiments -- these are greens, imperialists bent on rapid conquest and epic destruction. They wear a telepathy band on their large heads for communicating and reading the thoughts of puny Earthlings (unless these are wearing their tin foil hats). 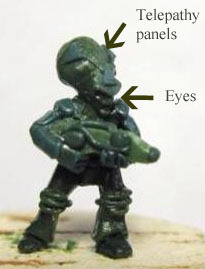 As the models have extremely small eyes and the telepathy panels are large and prominent on their craniums, here's an image showing where the eyes are! 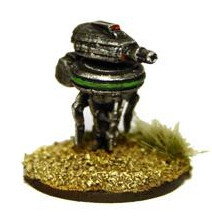 Martian models are approximately 13mm tall, except the OG War Robot, which is roughly human height (but far stronger and nearly indestructible). 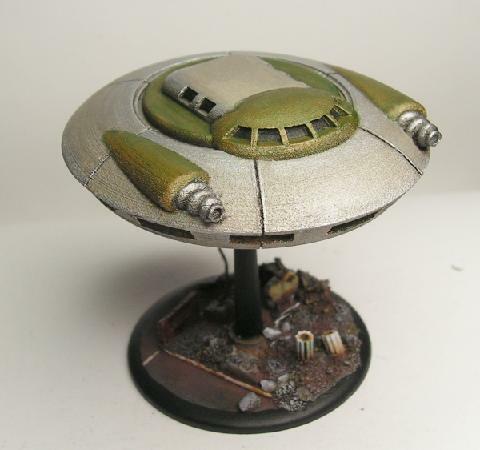 Flying Saucer is a one piece resin kit, with a pewter base and flight stand. Green men sculpted by "Whiff Waff," flying saucer designed by Mark Mondragon. 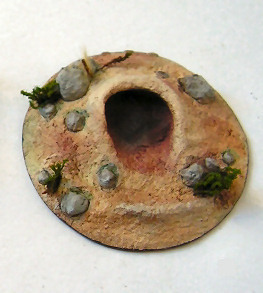 "Earth Ruins" detailing on the bases was added by the painter and is not included with the models. 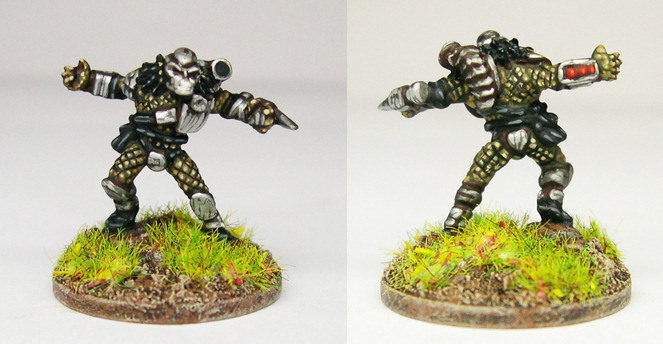 Dethroid Blastroid painted by Artmaster Studio. They came to our world, the diabolical Dethroids did, hideous shriveled creatures encased in heavy armoured anti-grav shells who crave nothing but the destruction of all life. They must remain forever inside their personal body armour or their bodies turn inside out � and explode. 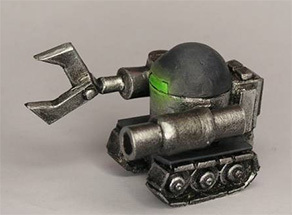 Not that they'd want to come out anyway, for the heavy antimatter cannon in the turret/head of each rank and file Dethroid (these being called Blasroids) is much too enjoyable to use on their victims. 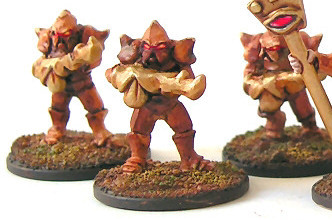 Lording it over the Blasroid ranks are the cunning and imperious leaders of these pitiless beings, the Overroids. 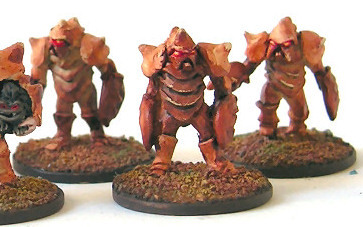 These make up the command elements of the Dethroid legions, and subject their foes to demeaning conversation before ordering the blasroids to "Obliterate!" them, as the unfortunate foes are consumed in the blast whilst shrieking in agony -- music to the ears of any Dethroid! 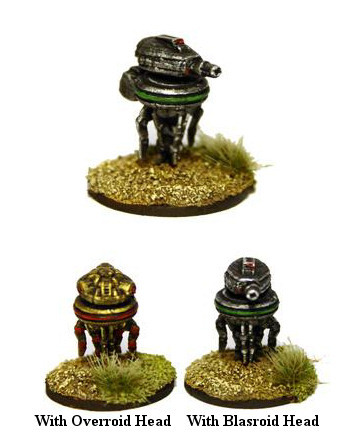 These pitiless units, floating low over the ground, their mechani-feelers fiendishly clanking as they drag along the surface, are sold in packs with four bodies, four Blasroid gunturret heads, and one Overroid head. Look out, they're coming soon!!! THOSE! painted by Chris Yaro. The rescuers, too late to save most of the family, found the little girl in a crawlspace in the shredded mobile home -- just a tiny spot too small for even THOSE to get her. THOSE? Yes, that's all she kept saying as the police chief interrogated her: "THOSE! THOSE! THOSE!" And soon the desert, irradiated by nuclear bomb tests, was crawling with THOSE, giant ants, four or five feet long, swarming in their thousands, tilting over Greyhound buses and pouring through the doors, carrying their screaming victims away and deep into huge anthills ... to serve as food for the larvae. 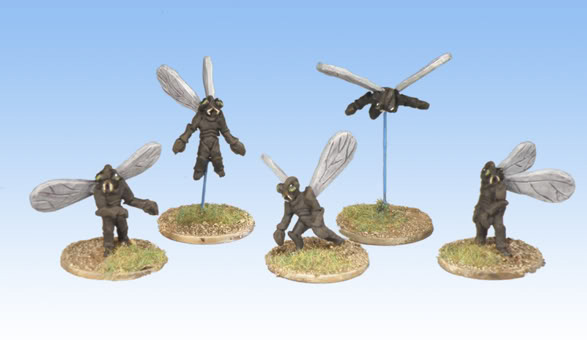 Giant ants to provide a serious nuisance to 28mm models, a menace to 15mm opponents, and virtual apocalypse to the smaller scales. Two poses, ant bodies are 12mm long including nasty mandibles. 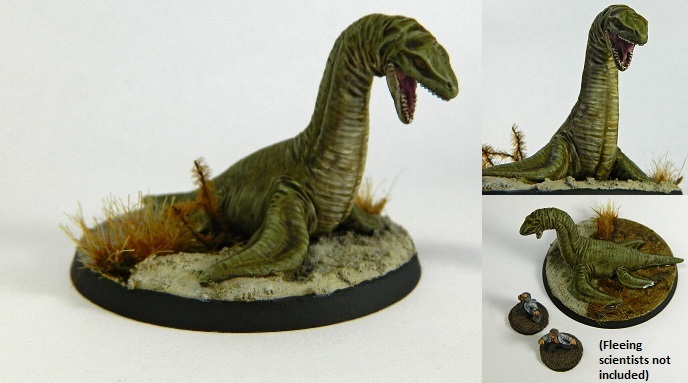 Escargon painted by Neldoreth. 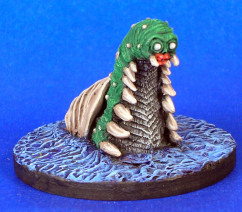 Model has a small water base sculpted on; Neldoreth attached it to a larger base (not included). Their eggs lay dormant for millions of years under the Chesapeake, until a rock concert caused reverberations that shattered the very earth itself, leading to the hatching of Escargon, a monstrous BEAST that will stop at nothing until it has CONFRONTED the entire GLOBE! Soon Escargon has laid millions of eggs, and its progeny are lumbering under the waves, then up and out, onto the dry land, the domain of Man himself. And now the rock-and-roll misfits in their leather jackets and hotrods must convince the adults that "the monsters are REAL!" and stop these fiends from leaving a slime trail ... across Washington DC itself! Huge snail monster with a face. Model is 25mm tall. 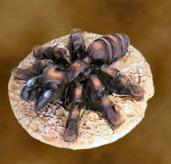 To see this model crawling across dry land, see Neldoreth's website, An Hour of Wolves and Shattered Shields. 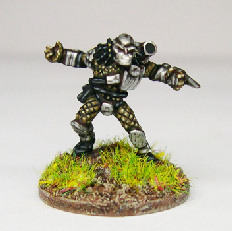 Torgon painted by Brand X Painting. He was just a small water lizard chasing a delicious fish into a crevice deep under the sea when they conducted the nuclear bomb test, or dumped the toxic waste, no one is quite sure which. Mutating madly, and positively furious that he'd been made to miss that fish, the little lizard rapidly became TORGON, the most enormous and vengeful of all creatures to haul himself out of the harbour, breathing a death ray all over helpless humanity as he stomps on tanks as if they were so many toys. Torgon's footsteps can be heard in the deep again! Will he rise, and if he does, will he help mankind in our struggle against Escargon? And if he wins ... what then? 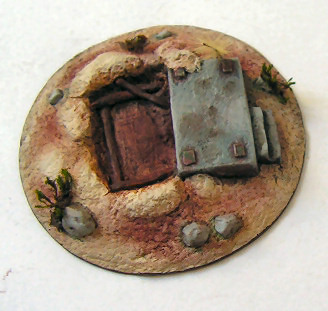 Waterline model is 25mm tall. Comes in two pieces, body and separate tail. Sculpted by Sandra Garrity. 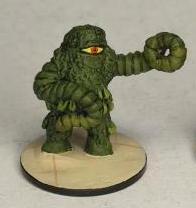 A lime goo painted by Chris Yaro. That shipment of limes from earth had something weird in it, some pulsating gooey thing that little Bobby found and put in a cardboard box under his bed until it emerged, huge and tentacled, to threaten the space station, and perhaps mankind itself! Don't shoot it, that's a fatal error, for that's how the fiends multiply, and now they are legion! 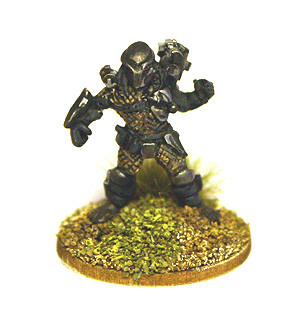 Models are 15mm tall to considerable eye. Three poses of one-piece models. Sculpted by "Whiff Waff." A Beach Terror painted by Chris Yaro. It was bad luck all around. Bad luck that the pirate ship had sunk off Clambake Beach all those hundreds of years ago, and even worse luck when the garbage barge dumped that nuclear sludge right on top of the wreck, and the skeletons of the evil pirates below. Rising up from the murky depths are the Terrors of Clambake Beach -- newly formed, they promptly march off to abduct attractive young women, and generally harsh the mellow of a bunch of kids just trying to enjoy their 60s lifestyle. Monstrous fish men with googly eyes. 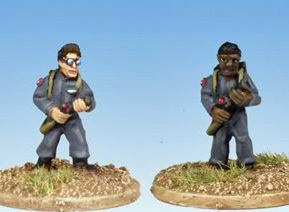 Models are 15mm tall to eye. Three poses of one-piece models. Sculpted by "Whiff Waff." 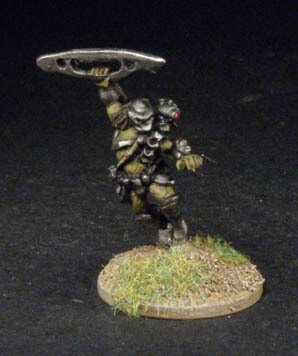 Plutoluna Mutant painted by Chris Yaro. Our declaring that their home world was not even a planet was the last straw. Although proud and physically very strong and tough, this warlike race from Pluto was no match for the Martians, who rapidly conquered the dark planet using vastly superior technology. Now they live under the yoke of imperious little green men, of all things, and to make matters worse the conquerors have set about mutating them into weird, mindless beasts with huge claws, the horrifying Plutoluna Mutants, to use as shock troops and cannon fodder in their invasions of more planets. Generic aggressive alien life forms with shells, some with claws. 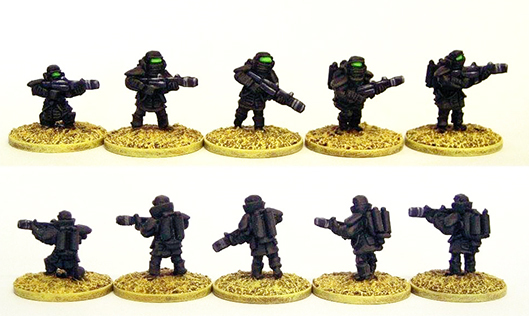 Models are about 15mm tall to eye. Seven unique models in three different sets. Sculpted by "Whiff Waff." 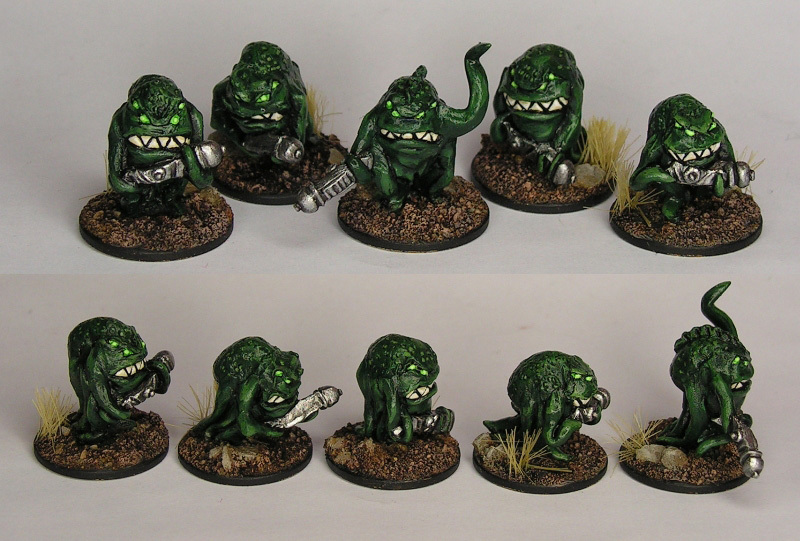 Munchers painted by Chris Yaro. 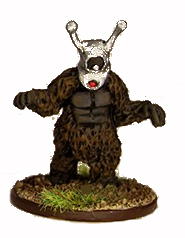 When the Plutonian Avengers came, they didn't simply bring vile guns and monstrous claws, they brought ... the Munchers. Just a few of the Munchers, ravenous little toothy furballs that will stop at nothing until they've stuffed everything edible, or nearly edible, in their mouths. Only a few at first, but soon these diabolical bioweapons will surely cover the planet, for after every meal, they promptly move their bowels, and in that product are swarming countless baby Munchers, ready to join the ranks! Alien cottonballs from hell, or, more accurately, from Pluto. 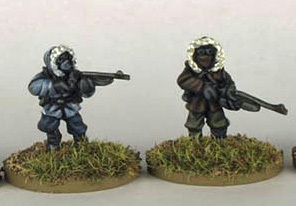 Models are about 8mm tall to top of head. Three poses of one-piece models. Sculpted by "Whiff Waff."